This is a fun little printable to teach your student/child the rhythm pyramid. 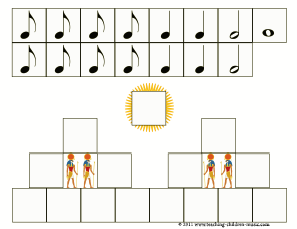 The rhythm pyramid shows several notes in layers that all have the same time value. A whole note has the same time value as two half notes. Two half notes have the same time value as four quarter notes, and four quarter notes have the same value as eight eighth notes. Each level of the pyramid has the same time value, but there are fewer notes on every level. That's the rhythm pyramid. My children are learning about Egypt this week, and so I made this printable to coincide with our lessens. The bottom half is the puzzle base, and the top half are cards meant to be cut out. You can laminate the sheet and use it again and again, or you can print it on cheaper paper, and have the children cut and paste the cards into the puzzle. Do instructions come with the beginning rhythm e-book? There is a 35 page e-book that has detailed instructions for the "I've Got Rhythm" boards. There are also some general instructions for the nursery rhymes and measure cards, but because of the nature of these, they are more of a tool and manipulative than a program. The video on the sales page gives a few ideas of what you can do with them, and I'm planning on making some more videos with suggestions in the near future. Thank you for asking! So what's this comunnity tab at the top?